Music Lesson Plan Template – 7+ Free Word, Excel, PDF Format Download! A music class is always an elaborate affair whether you are teaching at an elementary level or the high school students. 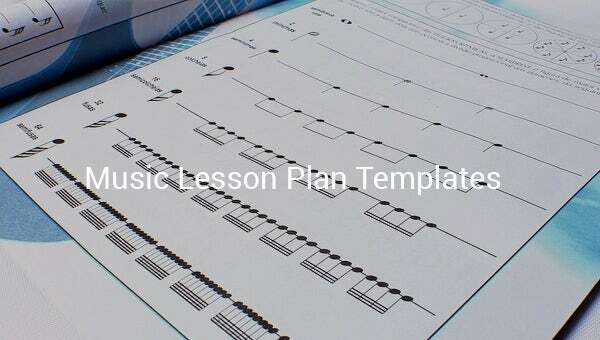 There are so many things to teach and hence you should follow an Elementary Lesson Plan Templates for music or high school music less plan- depending on your class. 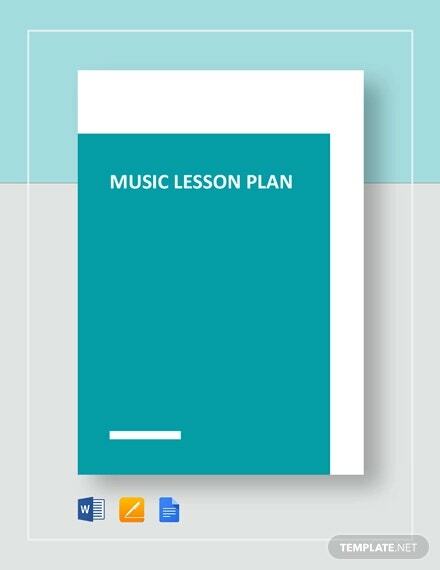 The lesson plan template will help you to stay organized with the typical music lesson you want to be learnt by the students. 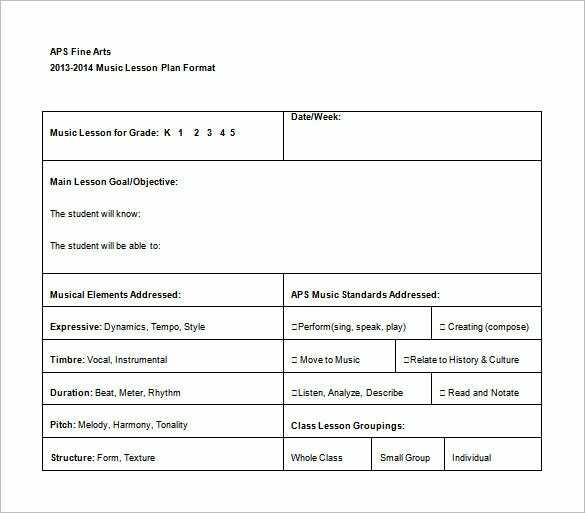 aps.edu | You are getting a standard fine arts music lesson plan template here. 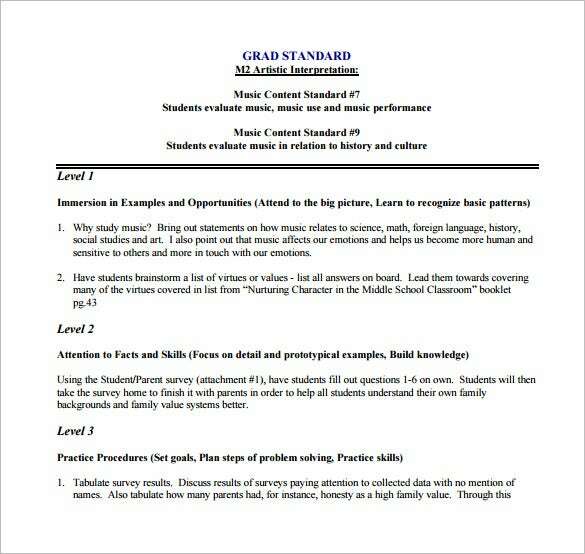 It begins with the lesson grades and is then followed by lesson objectives, the music elements addressed as well as APS music Standards addressed. 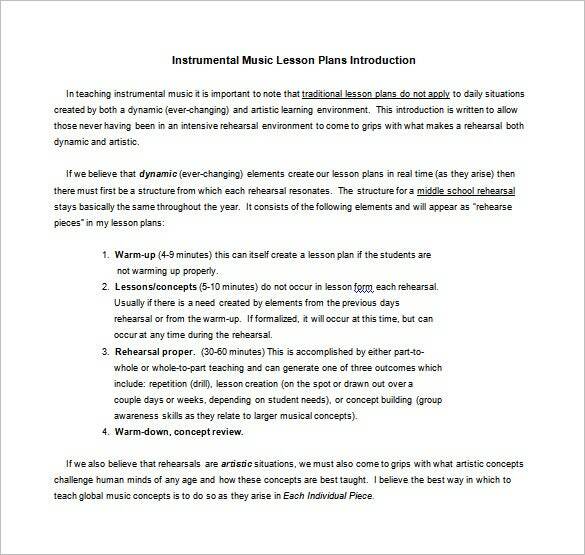 cyberwindsmusic.com | This is a standard instrumental music lesson plan document and it includes all the major parameters of a proper lesson plan such as warm-up, lessons or concepts to be discussed, rehearsal and finally concept review. sde.ct.gov | This is an elaborate elementary music lesson plan where you have every important parameter of a music lesson plan included on the left- such as lesson plan, grade, Standard, time, objectives, required materials etc. 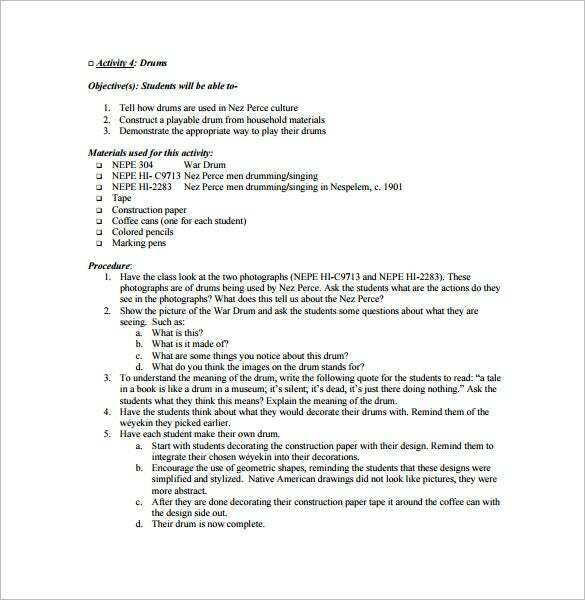 lawrence.edu | This is a blank proper lesson plan which can be customized easily as per your specific data for the noted parameters such as Standards, lesson objectives, the materials needed, instructions and so on. 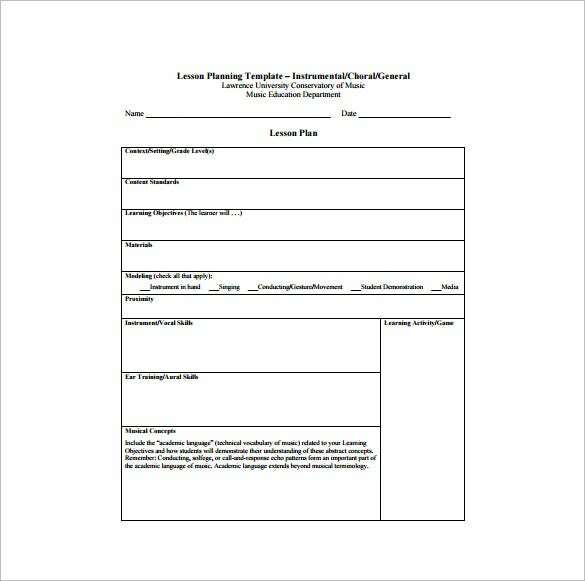 nps.gov | This music teacher lesson plan focuses primarily on 3 most important parameters such as objectives for the students regarding the lesson, the materials to be used for the activity and the lesson procedure. 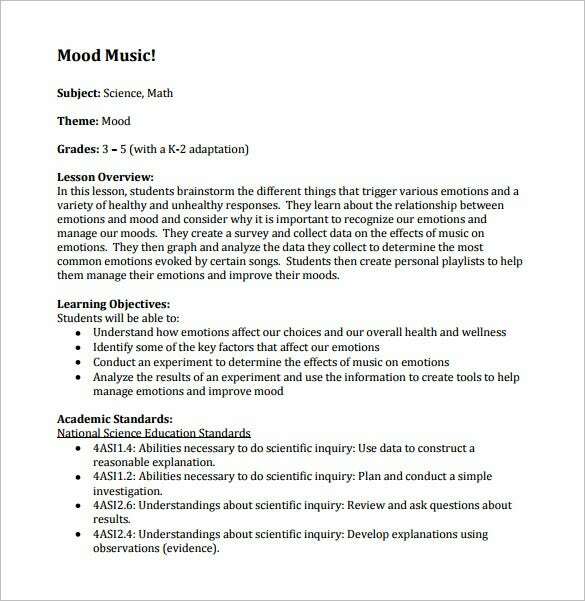 fit4theclassroom.com | This Mood Music lesson plan offers a neat and organized lesson plan which proceeds with name of the subject, the theme of the lesson, the grades and then goes on to discuss lesson overview, learning objective & academic standards. 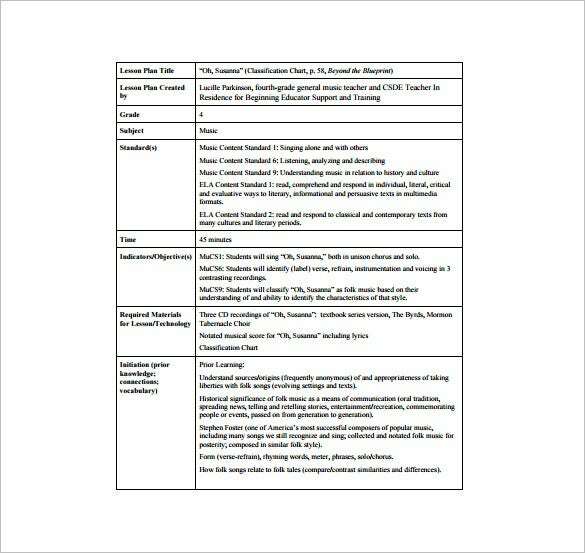 A music lesson plan template PDF will comprise of a number of things- such as pitch focus, rhythm focus, any new vocabulary, technology used and instrument used. It will also have place for the Lesson Plan Templates resource and summary of the lesson learnt.